I’m so tired. Exhausted, to-the-quick tired. I worked on a lot of things during today’s ride – but most of all, I worked. Well, I wasn’t alone. Derbs worked up a sweat too. The horses have been in for the last two days, so I wanted to give Derbs a long ride to get his blood pumping and alleviate the crushing boredom of being stuck inside. I’ve also been musing on a conversation Christy and I had on Friday, and was freshly motivated to get back to work. I took the afternoon off on Friday, and scampered out to the barn to watch Christy ride and sneak in an extracurricular lesson. 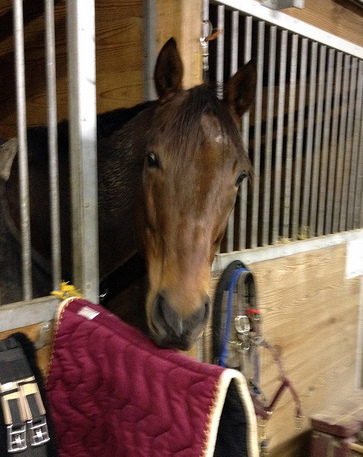 I got to watch her on Remy, and during her ride, she asked him some questions she’s not posed to him previously, and he answered with aplomb, elevating his carriage and gaits well beyond Training – or First, for that matter. 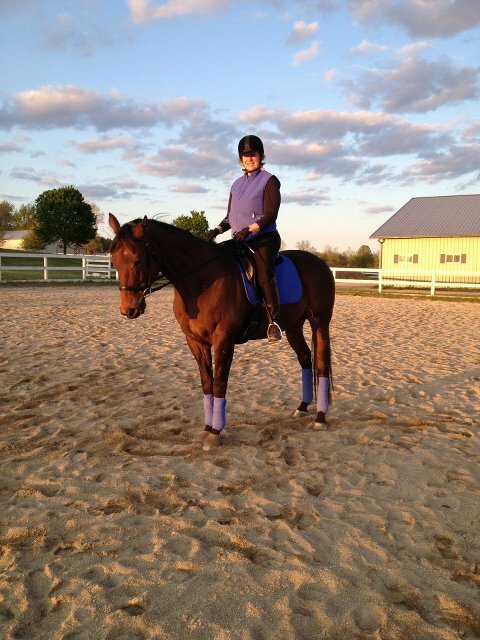 After her ride, Christy and I talked about how she produced this dramatic new way of going. The first thing she said was, “I was working really hard.” And I could see that as she rode – her posture and shorter reins were creating a different framework for Remy, and she had to hold it together – and keep him through – while he figured out how to configure himself to fit. 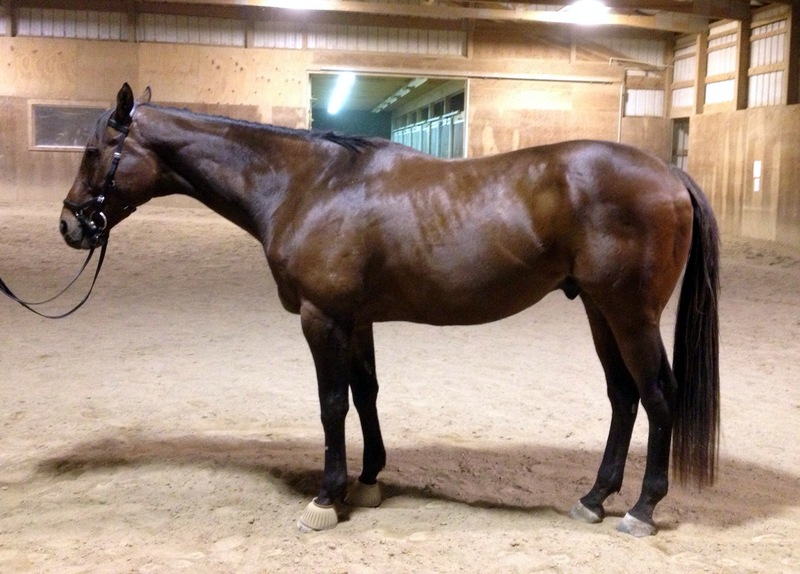 “You were creating a new space for the horse,” I concluded. 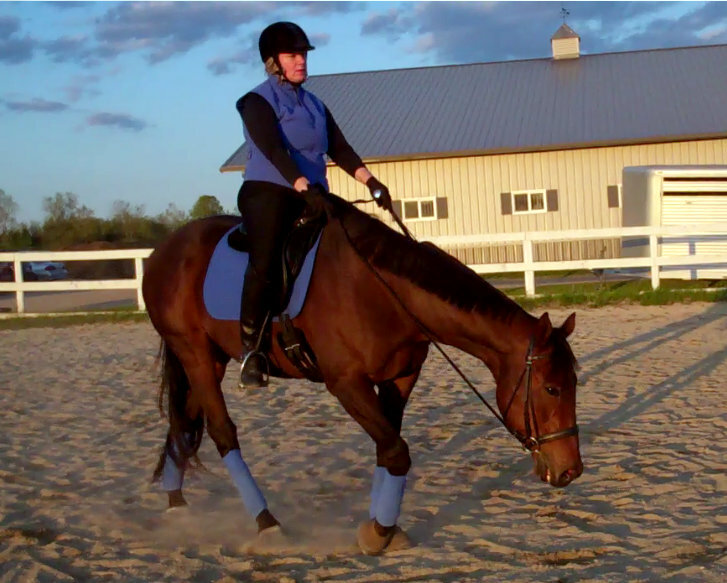 So I went away thinking about how the rider’s position dictates the horse’s way of going. I know that Derby is very sensitive to how his rider – whether it’s me, Liz or Christy – is sitting and how they’re balanced. 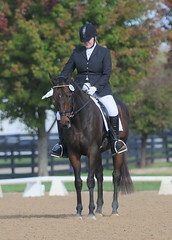 Changes that you could consider fairly slight to the rider’s seat produce dramatic changes in his gaits. 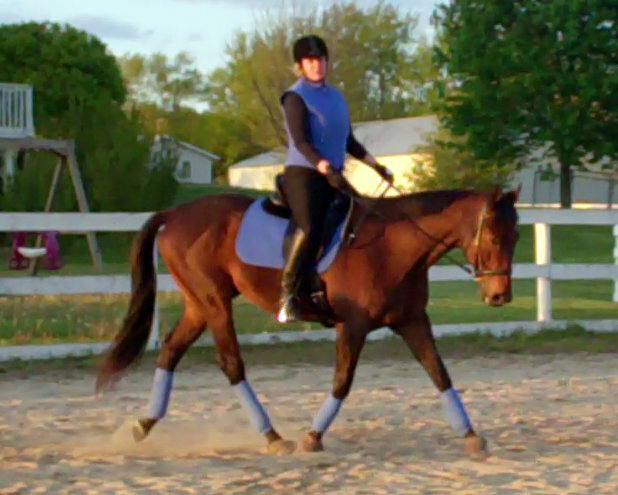 So now I’m thinking a little differently about creating desirable gaits. It’s less about doing things to the horse. It’s more about creating the space with my seat that encourages the horse’s back to come up and his shoulders to move, and framing that space with my legs and hands to further define the movement more exactly. 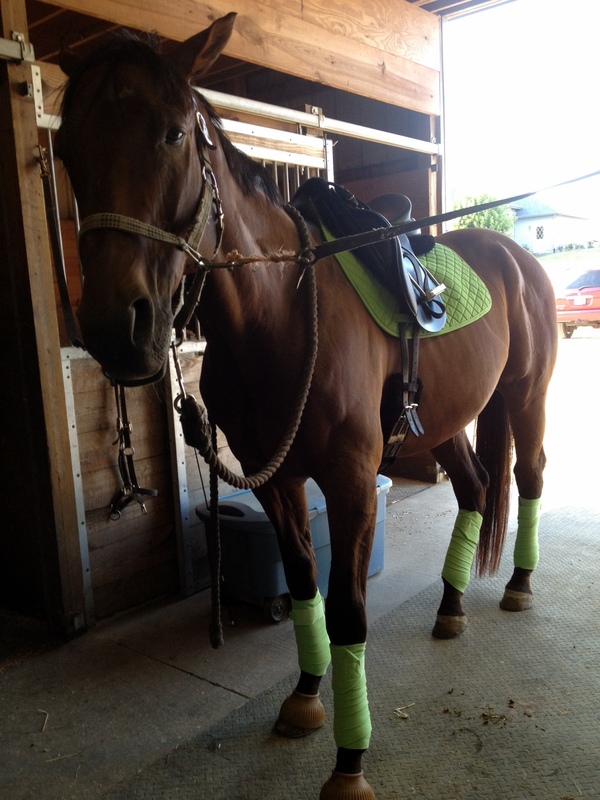 So after giving the horse yesterday off, today I was ready to ride. And “creating the space for the movement I want” was top of mind. 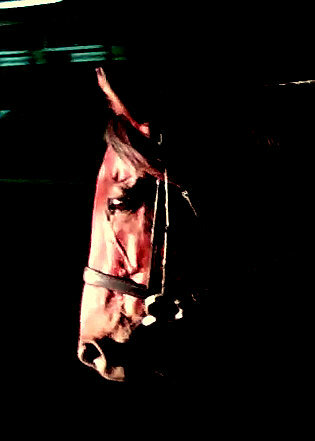 I was also thinking about something else Christy and I had discussed on Friday, which was the ongoing management from the saddle, conscious or not, that dressage requires. I still remember the day I realized (as silly as this sounds now) that the horse is never going to magically put himself on the bit and round his back – whether or not that happens, and the degree to which is maintained, is up to the rider. 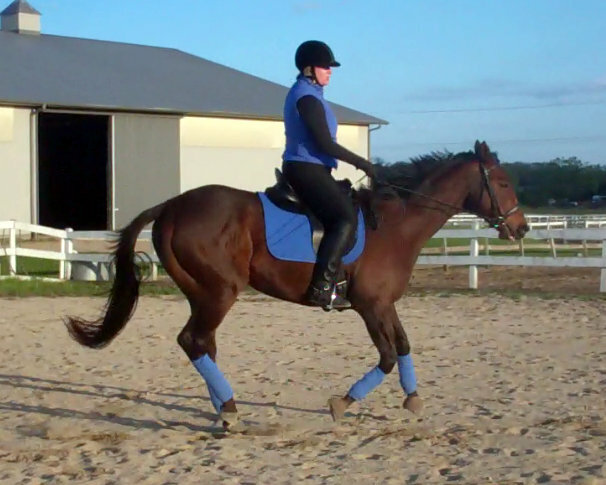 You have to ride almost every stride. Literally. So those still reading this post who’ve also made it through my other recent ramblings know that “multitasking” as I call it is still a challenge. 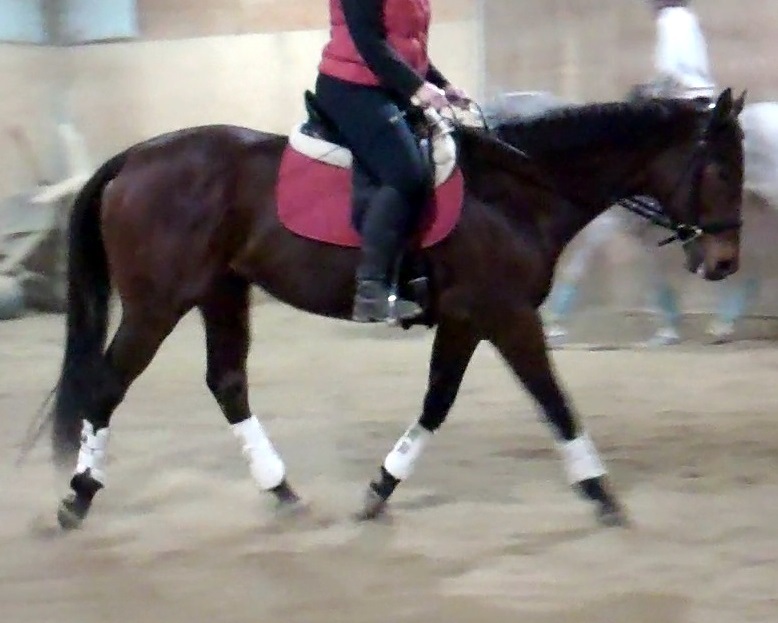 Creating forward gaits, maintaining bend, softening this, half-halting, applying leg, and constantly, constantly checking (and correcting) my position makes for a grueling and intense ride – like today’s. We had some really nice moments, but they weren’t luck. 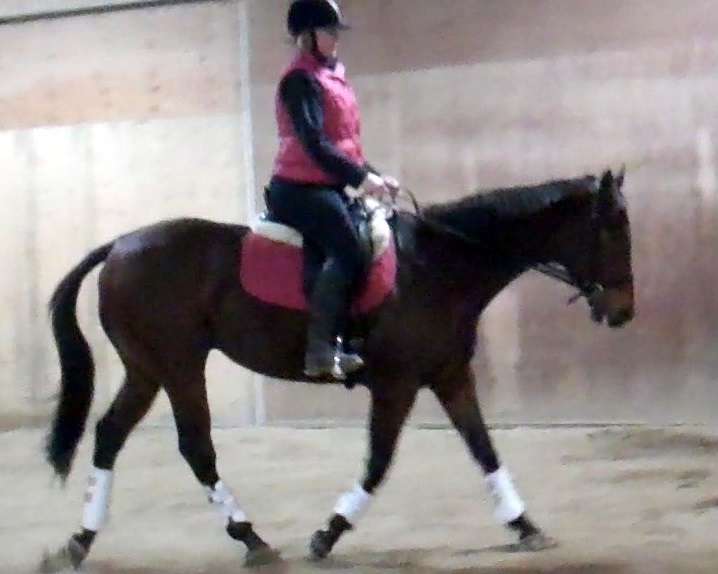 I was working hard – to still my lower leg, keep my hips open, feel my seatbones and my balance and adjust accordingly, hold my core and hold the reins, and make all the myriad adjustments along the way. When I got it right, Derby stepped right up to the plate. I could feel his back coming up, his back legs pushing, and that magical connectedness when you actually can feel the inside hind and the power that it drives held in the reins. Afterward, I was surprised at how wiped out I was. My hair was soaking under my helmet, and my t-shirt was wet – despite the fact that it was in the 30’s this afternoon. My legs were shot and when I finally got into my car, fired up the seat warmer and started to drive away, I felt like pulling over for a nap before continuing my 25 minute ride home. It’s just after 6 pm as I’m tapping out this post, and I’m determined that I will NOT crawl into bed before 9 pm. I’m *still* whipped from today’s ride. No complaints, though!